Brooks Gylcerins were my shoe of choice during 2015 when I last took running seriously. I went through 3 pairs of them over the course of the year. They saw me through two half marathons, a handful of 10ks, and several other races, never mind the hundreds of training miles. 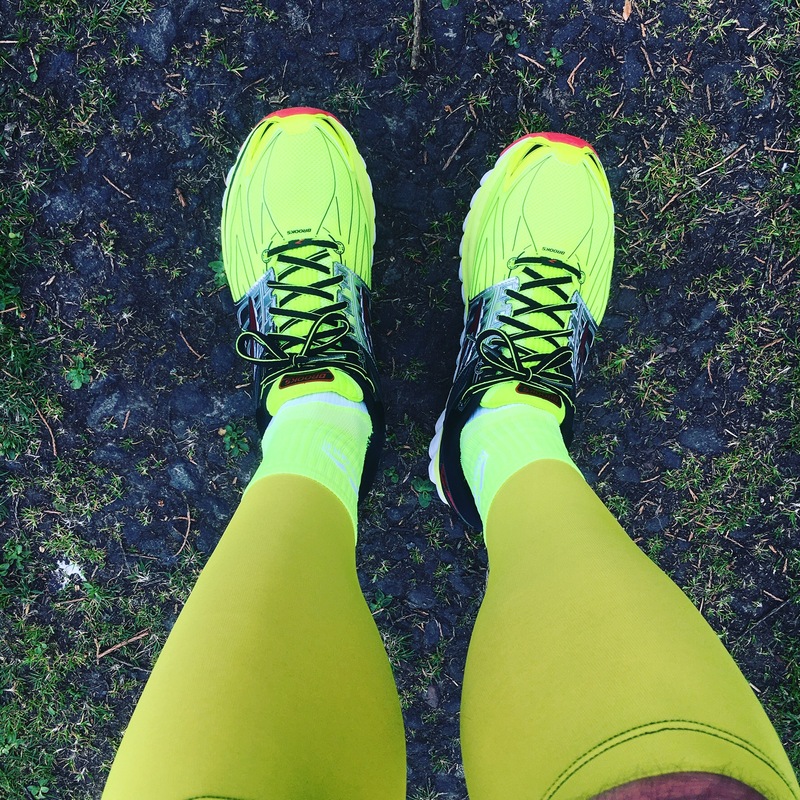 When I stopped racing, I stepped down a model to the Brooks Ghost, and because I did very little running in 2016, they’ve been the shoes I started this latest running journey in. Thanks to Strava, I can keep track of the mileage the shoes have done, and a couple of weeks ago they tipped over the 300 mile mark. The general rule of thumb is to change your shoes between 300-400 miles – they start losing shape and the cushioning in the sole will have worn down. So I bought myself a new pair, planning to alternate for a few weeks to break them in gently. As you can see, I decided to go back to Glycerins for 2017, and the dayglo ones at that. You won’t miss me on dark nights with these bad boys! It’s a good job that I got them when I did, as I noticed this morning, just as I was about to go out for my long run, that the Ghosts were coming away at the sole. I did get nearly 350 miles out of them over two years to be fair. I’d forgotten how good the Glycerins feel. They’re like the most comfortable slippers you’ve ever had, and out of the box they feel super-springy! They managed the 11 miles no problem this morning, so that’s them broken in now. Training-wise it’s been a funny old week, my heart-rate was a fair bit higher than it should have been for my mid-week runs. It’s only been this weekend that I’ve felt back to normal again. I’m putting it down to my hay fever – I had another terrible evening run on Wednesday, just no energy in the tank whatsoever. Yet I was able to run fine on Thursday morning. Even today I felt out of sorts the first few miles. It was also pretty warm, and it took me a good 5 miles to start feeling better. Today’s run was 11 miles, with the last 20 minutes at a faster pace. I actually felt better running faster than I had done on the easier miles! Go figure…. There’s one more week left now before I start my marathon training plan. The temperature is due to drop a little this week – forecast is around 10c for my morning runs this week (I’m usually out around 5.45am) which I much prefer.